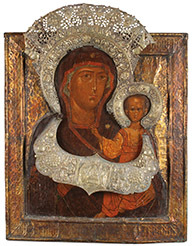 A LARGE AND FINE RUSSIAN DOUBLE SIDED ICON OF THE HODIGITRIA MOTHER OF GOD, AND SAINT NICHOLAS, CIRCA 17TH CENTURY. Here Mary holds her infant son Christ who delivers a blessing and holds a scroll. She gestures towards her son with her right hand directing the viewer to the source of salvation hence the title "Hodigitria" roughly translated from the Greek as "Way-Shower" or "Guide". Executed in the traditional old style, the light blue chiton of the Virgin is covered with a burgundy-purple maphorion decorated with three stars symbolizing her virginity. The borders and background are decorated with incised silver strips (basma). The heads of the Virgin and Christ are encircled with an ornate silver-gilt repousse and chased haloes displaying angels, seraphim and flowers. Suspended from the halo is a similarly decorated silver tsata repoussed with the Old Testament Trinity amidst large flower heads. The halo and tsata likely Yaroslavl although unmarked. 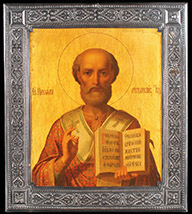 The reverse of the icon with an 18th century standard image of St. Nicholas, however with no embellishments. 23.5 inches x 18.5 inches. (60 x 47 cm). 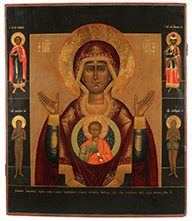 A LARGE AND FINE RUSSIAN ICON OF THE SIGN MOTHER OF GOD, CIRCA 1800. In this waist-up depiction of the Mother of God, the infant Christ (Emmanuel) is imposed upon her breast within a circular mandrola. On either side of the head of the Virgin is her Greek abbreviated title, Meter Theou. On the borders are depicted the Holy Martyrs George and James (top) and below the Venerable Makariy and Onuphrius. The lower margin with Slavonic inscription rendered in gold leaf, "A True Representation, Likeness and Measure of the Wonderworking Image of the 'Sign' Most Holy Mother of God Which is in Great Novgorod; painted in the year 1809." Together with a finely crafted, gilded, repoussed, and chased metal riza and halo. 22.5 inches x 21 inches (57 x 53.5 cm). In excellent condition. 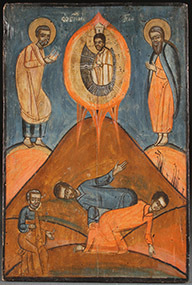 A LARGE AND INTERESTING PROVINCIAL ICON OF THE TRANSFIGURATION, 18TH CENTURY. Here Christ is depicted half-length within a radiant light (mandrola) atop Mt. Tabor as recorded in the Gospel of Matthew (17:1-9) and elsewhere. On the left, holding two tablets, is the Old Testament Prophet Moses and on the right Elijah. Below are the disciples Peter, James, and John who have fallen to the ground in awe at the sight. 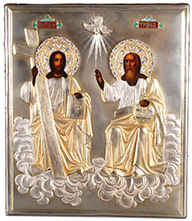 The inscription flanking the head of Christ is an illiterate rendering of the standard inscription which usually reads Преображение Христова - THE TRANSFIGURATION OF CHRIST. The interesting, albeit limited palette combined with the very immediate or direct overall rendering, create, in their naiveté, a certain charm which reflects in some ways the very pure and innocent piety of the Russian peasant soul. 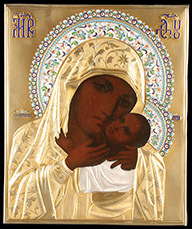 While such icons are sometimes attributed to northern regions of Russia, based on the panel construction and palette, it is more likely southwest Russian in origin. The Transfiguration is one of the twelve major feast days, celebrated on August 6th (old) or August 19th (new calendar). The larger than normal size would suggest the offered lot may have perhaps once been installed in the festival tier of an iconostasis in a small chapel. 19.25 inches x 13 inches (49 x 43 cm). A LARGE AND ATTRACTIVE RUSSIAN ICON OF THE THEOPHANY OF OUR LORD JESUS CHRIST, CIRCA 1600. 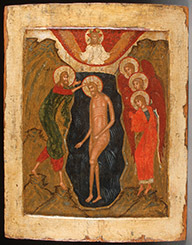 This icon depicts the baptism of Christ in the Jordan River by John the Forerunner (Baptist). At top center within stylized clouds representing the heavens is depicted God the Father delivering His blessing, looking down upon His beloved Son, of whom He is well pleased (Matthew 3:13-17). His head is encircled by a halo with an eight-pointed glory (slava) signifying the Day of Eternity. Beneath him Christ stands in the Jordan and on the left John baptizes him with water. On the left bank of the river are three angels of the Lord whose hands are covered with cloth as a sign of veneration. 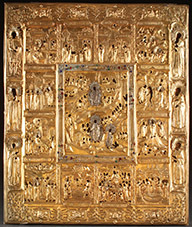 Likely from the festival tier of an iconostasis in a small chapel or church. 20.25 inches x 16.25 inches (51.5 x 41 cm). 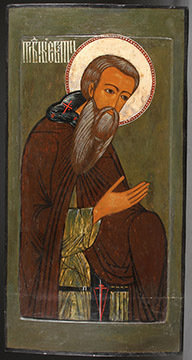 A LARGE RUSSIAN ICON OF THE VENERABLE SAINT SAVVATIY SOLOVETSKIY, 17TH CENTURY. Painted in somber colors against a green ground. Likely from the left side of a significant size iconostasis, probably reduced on the bottom otherwise in very good condition. 35 inches x 18.5 inches (89 x 47 cm). 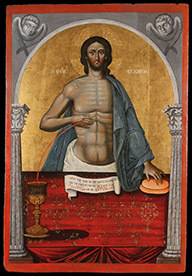 A RUSSIAN ICON OF CHRIST IMMANUEL, 17TH OR 18TH CENTURY. Here Christ is depicted as a youth as taken from Isaiah 7:14 "Behold, a virgin shall conceive, and bear a son, and shall call his name Immanuel." In some cases, as in the offered icon, Christ Immanuel is depicted alone, whereas in other examples he may be depicted flanked by angels on a larger horizontal panel or as part of a three piece grouping. Immanuel is a representation of the Son, "begotten of the Father before all worlds." 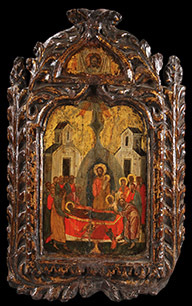 The offered icon is executed on a wood panel with a double raised border (kovcheg) typical of icons produced in the 17th century. 12.25 inches x 10.25 inches (31.25 x 26 cm). A LARGE AND IMPRESSIVE RUSSIAN ICON OF SAINT JOHN THE FORERUNNER, 17TH CENTURY. Here John is depicted full length turned towards Christ in an attitude of prayer. Known in Western Christianity as John the Baptist, in Eastern Orthodoxy he is commonly called John the Forerunner as he was the forerunner of Christ's earthly ministry. Here he is depicted wearing the typical hair shirt (vlasyanitsa). The inscription to the right of his head identifies him as Святой Иоанн Предтеча - The Holy John the Forerunner. 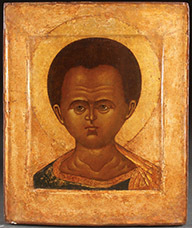 The large size of this icon and the configuration of John would suggest this icon was once part of the Deisis tier of an iconostasis, right side. 43.5 inches x 12.6 inches (110.5 x 32 cm). 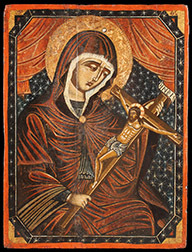 A GREEK ICON OF THE MOTHER OF GOD EMBRACING A CRUCIFIX, 17TH CENTURY. Sensitively painted in dark somber colors, the gilt halo of the Virgin punched and incised and the blue background and borders rendered with stars. 16 inches x 12.25 inches (41 x 31 cm). 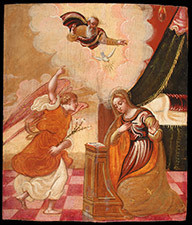 AN ITALO-CRETAN ICON OF THE ANNUNCIATION, CIRCA 1700. Here the Archangel Gabriel holding a bouquet of lilies announces to Mary that she will bear the Savior of the World. The Holy Spirit, in the form of a dove, descends upon her in a cloud. 13 inches x 11.25 inches (33 x 29 cm). 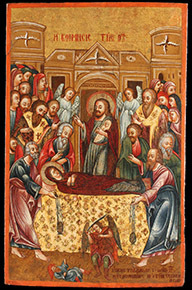 A NORTHERN GREEK OR MACEDONIAN ICON OF THE DORMITION, 18TH CENTURY. Colorfully painted, here the Mother of God reclines on the funeral bier as Christ receives her soul depicted as a swaddled infant, as the Apostles and others look on. Indistinctly inscribed lower right, 'Prayer of the servant of God Georgios ****** with his wife and children.' Dated 1739? 18.8 inches x 12 inches (48 x 30.5 cm). 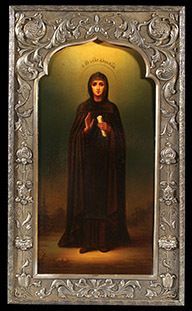 AN IMPORTANT IMPERIAL RUSSIAN PRESENTATION ICON OF SAINT ANNA KASHINSKAYA, VLADIMIROV, ST. PETERSBURG, 1909. Within an ogee arched reserve, a full length figure of a female monastic saint identified by the inscription in her halo as The Holy Venerable Princess Anna Kashinskaya. Overlaid with an exceptionally well crafted silver gilt repousse and chased riza in the Art Nouveau taste. The verso covered in faded velvet and with applied silver gilt plaque engraved in Cyrillic script reading To Her Highness Queen Olga Konstantinovna Blessing of the Loyal Homeland from Prince Mikhail Andronikov September 1909. The riza hallmarked St. Petersburg, 1908-1917 and Cyrillic maker's mark VLADIMIROV and with 84 standard. 13 inches x 8.6 inches (32.5 x 19 cm). 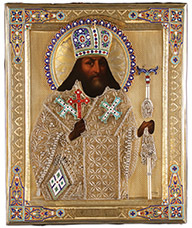 A RUSSIAN IMPERIAL PRESENTATION ICON OF SAINT NICHOLAS FROM THE EMPRESS MARIA ALEXANDROVNA TO HER MAJESTY'S 2ND PSKOV LIFE-DRAGOONS REGIMENT, DATED 1875. Here Nicholas is depicted in his standard attire as Bishop, delivering a blessing and holding an open book of Gospels inscribed with a variation of the text from Luke 6:17 (The Sermon on the Plain) "At that time Jesus stood on the plain, and a multitude of his disciples..." The style of painting can be compared favorably to icons produced by the dynastic icon painting family Sofonov, originating from Palekh but with a well-established presence in Moscow and to which the Imperial Warrant was granted for their work. The borders overlaid with a heavy silver repousse and chased riza, hallmarked Moscow, circa 1875 and Cyrillic maker's mark ИГ, probably for the firm of Ivan Gubkin. The verso covered in velvet and displaying an engraved silver dedicatory plaque which reads "To Her Majesty's 2nd Pskov Life-Dragoons Regiment from the Most August Chief 6th December 1875." The most August Chief in 1875 would have been the Empress Maria Alexandrovna who was the ceremonial chief of the regiment at that time. 14 inches x 12.25 inches (35.5 x 31 cm). A FINE MILITARY PRESENTATION RUSSIAN ICON OF THE TRINITY, MOSCOW, CIRCA 1896-1908. Executed in the popular Western style, here Christ (left), God the Father (right), and a dove (top center representing the Holy Spirit), together form the New Testament Trinity. The entire image overlaid with a finely crafted, multi-piece, silver-gilt, repoussed, and chased riza with shaded enamel haloes and champlevé enamel title plaques. Hallmarked Moscow, circa 1896-1908 and with indistinguishable Cyrillic maker's mark and 84 standard. The verso with silver-gilt and champlevé enameled presentation plaque dedicated to: "The Viceroy of Their Imperial Highnesses in the Caucasus General-Adjutant Count Vorontsov-Dashkov from his attendants 1898." Contained in a later glazed shadow box frame. 12.25 inches x 10.5 inches (31 x 27 cm). A LARGE AND IMPRESSIVE RUSSIAN ICON OF THE RESURRECTION AND DESCENT WITH FEAST DAYS, 19TH CENTURY. The central reserve depicting at top the resurrected Christ above His empty tomb and below the Descent into Hades each surrounded by related scenes. The margins painted with scenes representative of the 12 major Church Feast Days and each with corresponding inscriptions identifying the subjects. The left border from top to bottom with the Archangel Mikhail, the Apostle James, and St. Paraskeva and the right border with the Three Hierarchs. Together with a stunningly impressive gilded silver, repoussed and chased riza with filigree and paste stone embellishments. Hallmarked St. Petersburg, dated 1862, stamped with Cyrillic maker's mark "A. SOKOLOV", and 84 standard. 21.25 inches x 17.5 inches (54 x 44.5 cm). Total weight of riza 47.5 troy ounces. A VERY FINE SILVER GILT AND ENAMELED RUSSIAN ICON OF SAINT THEODOSIUS OF CHERNIGOV, MOSCOW, CIRCA 1896. 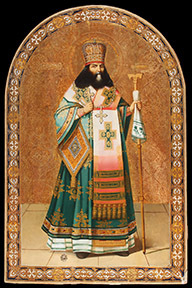 Here is depicted a finely rendered half-length image of Saint Theodosius, Archbishop of Chernigov (Святитель Феодосий, архиепископ Черниговский). He is depicted in the ornate attire of an Archbishop wearing an embellished mitre, omophorion, palitza, holding an altar (or blessing) cross and crosier. His painted image is entirely overlaid with an extremely ornate engraved gilded silver riza with intricate silver wire filigree (скань) overlaying the vestments and further decorated with cloisonné enameled blessing cross, mitre, palitza, crosier, finial, halo, and corners. The lower margin with engraved cartouche identifying the subject as THE HOLY THEODOSIOUS OF CHIRNIGOV. Hallmarked Moscow, circa 1896, and with Cyrillic maker's mark С.Г.В. for Moscow silversmith Sylvester Gerasimovich Volkov and with 84 silver standard. The verso with original velvet covering. In an excellent state of original preservation. 10.5 inches x 8.75 inches (27 x 22 cm). A FINE RUSSIAN ICON OF THE KASPEROV MOTHER OF GOD, MOSCOW, CIRCA 1908-1917. Finely painted in the Western style, the entire image overlaid with a spectacular multi-piece gilded silver, repousse, and chased riza with exquisite shaded enamel halo and champlevé enamel title plaques. Hallmarked Moscow, 1908-1917, Cyrillic maker's mark SG and 84 standard. 10.25 inches x 8.75 inches (26.5 x 22.2 cm). A LARGE AND IMPOSING RUSSIAN ICON OF ST.THEODOSIUS OF CHERNIGOV WITH RELIC, CIRCA 1900. Executed on a large arched panel against an ornately incised gilt background, displaying a finely painted full length image depicting Theodosious (Feodor) in the ornate attire of a bishop wearing a gem encrusted mitre holding a cross and crosier. At lower left an inset star-shaped reliquary and the borders ornately incised and painted in faux enameling. 42 inches x 27.75 inches (106.5 x 70.5 cm). AN EXCEPTIONAL RUSSIAN PRESENTATION ICON OF THE GUARDIAN ANGEL AND SAINTS, CIRCLE OF CHIRIKOV, MOSCOW, CIRCA 1900. 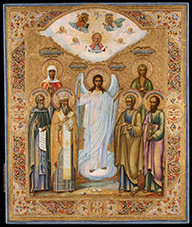 A finely painted icon of the highest quality depicting the New Testament Trinity at top above an image of the Pokrov Mother of God and below a gathering of six saints with the Guardian Angel at center. Identified by the inscriptions above their heads on the left are depicted the Holy Martyr Natalia, Saint Sergiy of Radonezh and the Holy Evstafiy (Eustace) Bishop and Patriarch of Antioch. On the right, The Holy Mary of Egypt and Saints Peter and Paul. The gilt background ornately incised and punched with a repeating cross-form pattern. The borders finely incised and painted with scrolling foliage and strapwork executed to simulate cloisonné enameling. The verso of icon with period dedicatory inscription "From the zealous officials and peasants of the Ascension, Resurrection, and Mekhovits districts who had this icon made for the provincial Governor of the Kovrov District Evstafiy Alekseyevich Lord Kishkin due to his honorable relationship with them and his service and fatherly love to them". The lower central margin bearing a likely later added inscription in Old Slavonic Painted by Iosif Sem. Chirikov in the year 1895. The overall quality of the offered icon is exceptional and it exhibits characteristics of those icons produced in the best Moscow workshops such has Chirikov, Gurianov, and Dikarev. Of particular note are the decorated haloes and the name plaques with distinctive lettering and shaded backgrounds. Also worthy of mention is the exceptional chrysography utilized to ornament the vestments, all typical of the popular icons produced in the Imperial workshops at the turn of the century, mostly in Moscow by iconographers trained in Palekh, Mstera, or Kholui and as found on icons painted by Chirikov. 17.75 inches x 14.75 inches (45 x 37.5 cm).